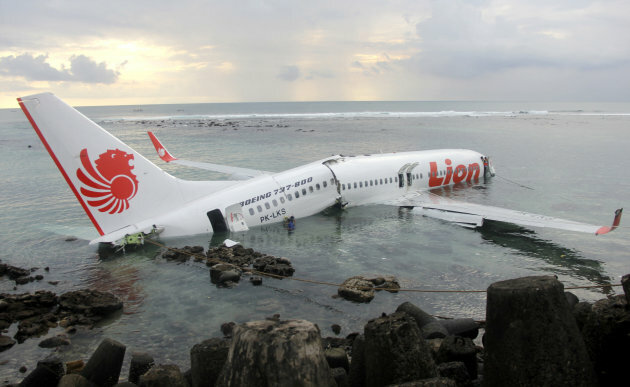 BALI, Indonesia (AP) — A Lion Air jet that slammed into the sea as it tried to land on the Indonesian resort island of Bali over the weekend remains stuck in shallow water and must be cut into pieces for removal, vividly underlining the challenges facing the budget airline as it races to expand in Asia. Authorities initially planned to tow the Boeing 737-800 aircraft that split in two, but have now determined it is too heavy and must be carved into several parts to avoid the possibility of damaging the area's coral reefs, said Transportation Ministry spokesman Bambang Ervan. The tail is perched on top of a reef, making it unsteady when sets of waves hit the wreckage. Divers have also faced difficulties recovering the cockpit voice recorder from the plane's partially submerged rear, a key part of the investigation as officials work to determine what caused the crash. The flight data recorder has already been removed. All 101 passengers on the domestic flight — including five foreigners from Singapore, France and Belgium — and seven crew members survived Saturday's crash, and no one was seriously injured. The plane's belly thumped into the sea short of the runway at Bali's Ngurah Rai airport, fracturing the fuselage. The accident has raised questions among some analysts about whether Lion Air may be putting growth ahead of safety. Indonesia's largest private airline, which was started in 1999 by two brothers who pooled $850,000, stunned the aviation industry two years ago when it announced the biggest-ever order for Boeing planes — 230 jets in all — at an event with President Barack Obama. It made headlines again last month after signing a $24 billion deal to buy 234 planes from Airbus, the French aircraft maker's largest order ever. Lion Air has about 45 percent of Indonesia's air travel market and hopes to increase that to 60 percent by 2014 as cheap travel continues to boom in the sprawling archipelago of 240 million people. The airline has had seven accidents and incidents since 2002. Most were minor and all but one occurred during landing, according to the Aviation Safety Network's website. The worst crash in 2004 killed 25 people. The pressure to keep planes flying, coupled with the difficulty of finding enough qualified pilots can create a bad combination, said Tom Ballantyne, a Sydney-based aviation expert. "It's certainly an issue for fast-expanding airlines," he said. Indonesia is one of fastest growing air travel markets in Asia, but the country has a troubled past when it comes to air safety. In 2007, the Europe Union banned all Indonesian airlines due to the country's poor record. It has lifted restrictions for some carriers as improvements are made, but Lion Air remains on the blacklist. Despite efforts to clean up the industry, Indonesia has struggled to find enough qualified pilots, mechanics, air traffic controllers and inspectors. Airport technology and infrastructure also lag behind, highlighted by a 15-minute blackout late last year at Jakarta's international airport that disrupted its 26-year-old radar system. Indonesia currently needs up to 800 pilots a year, but it can only prepare about 500, Transportation Minister Evert Ernest Mangindaan said at a news conference. "We have to say that we still lack pilots in the face of this air travel boom," he said. Foreign pilots are now being employed to work for domestic airlines and flight schools are being established, he said. Alvin Lie, a former Indonesian lawmaker and aviation analyst, said Lion Air's aggressive push to buy more aircraft is likely adding to the burden on its pilots. But he said the Bali crash will likely not affect business in Indonesia. However, the airline has also positioned itself to take on budget carrier AirAsia, which dominates no-frills travel in the region. "If abroad, that would definitely reduce consumers' confidence," he said of the crash. "But the characteristics of consumers here are different. The most important thing for them is the cheap price." Karmini reported from Jakarta, Indonesia. Associated Press writers Margie Mason and Ali Kotarumalos contributed to this report from Jakarta. Divers have also faced difficulties recovering the cockpit voice recorder from the plane's partially submerged rear, a key part of the investigation as officials work to determine what caused the crash. Divers? The rear inside of the plane appears to be waist deep at the most.